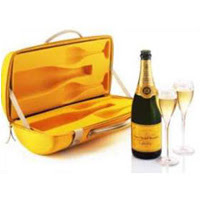 You can get Champagne on the Go - a bottle of Veuve Clicquot and 2 glasses in a convenient yellow travel case. The case is made of neoprene and leather and is insulated. Have this ready in your get away car after your reception. Then refill and reuse it for picnics or excursions.